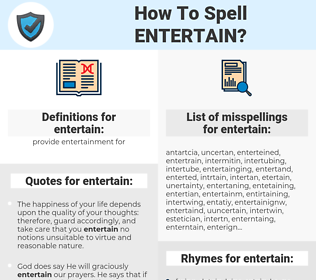 What are the misspellings for entertain? What are the common mistypes for entertain? What is the definition of entertain? What are the quotes for entertain? What are the rhymes for entertain? What are the translations for entertain? 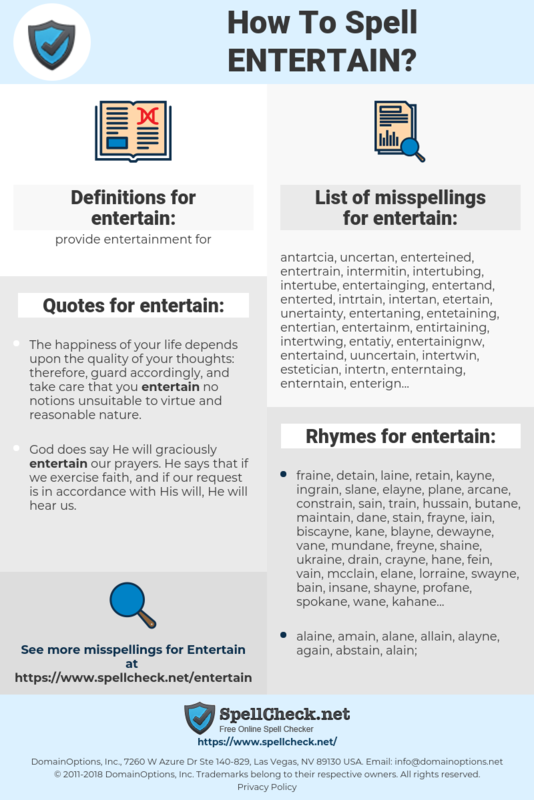 What are the common typos for entertain? This graph shows how "entertain" have occurred between 1800 and 2008 in a corpus of English books. onderhouden, vermaak, vermaken, entertainen, amuseren. accueillir, envisager, recevoir, divertir, distraire, amuser. 楽しませる, もてなす, 相手をする, ふるまう, 振舞う, 持て成す, 接伴, あいてをする, 振る舞う. развлекать, занять, лелеять (мечту), питать (надежду), устраивать приём. considerar, albergar, recibir, entretener, abrigar.